Stephanie Annette Johnson was born on June 13, 1962 in Montclair, New Jersey. Stephanie was a graduate of Summit High School. She was also an Honor graduate of Katherine Gibbs Secretary School. She was employed as an Executive Secretary at AT & T in Berkley Heights, New Jersey for several years. On Thursday, September 13, 2018, Stephanie Annette Johnson passed away at the age of fifty-six. 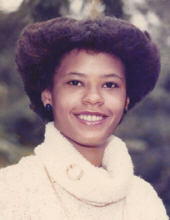 She was predeceased by her sister, Joan Johnson in 1994; and father, Frank Slaughter, Jr.
Stephanie leaves to precious memories, her mother, Doris Johnson; two daughters: Sheena White and Jada Francis; two sons: Marcello James Texidor, Jr. and Javon Texidor; two sisters: Geraldine Johnson and Marjorie Johnson; three brothers: Craig Johnson, Kenneth Johnson and Raymond Johnson; devoted friend, Marcello Texidor; as well as many nieces and nephews, and a host of dear relatives and friends. To send flowers or a remembrance gift to the family of Stephanie Annette Johnson, please visit our Tribute Store. "Email Address" would like to share the life celebration of Stephanie Annette Johnson. Click on the "link" to go to share a favorite memory or leave a condolence message for the family.